Nasonex | Allergy | Dokteronline.com Helps You Along! 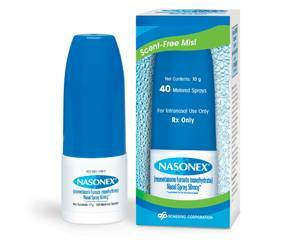 Nasonex is an anti-inflammatory nasal spray. It contains the active ingredient mometasone, which is a type of medicine known as a corticosteroid (adrenal cortex hormone). Nasonex nasal spray reduces symptoms which are the result of inflammation in the nasal passages such as a blocked or runny nose, sneezing and itching. Hay fever (allergy to pollen). Nasonex reduces inflammation and relieves symptoms such as repeated sneezing, nasal congestion or a runny nose. It is sometimes also used to treat nasal polyps in adults. Then clean the tip with a tissue and replace the cap. It may take several days to weeks for the benefits of Nasonex to appear. It is important that you take Nasonex regularly as recommended by your doctor, since its effectiveness depends on regular use. For more information on Nasonex nasal spray, see the package leaflet. Adults and children aged 12 years and above: two inhalations in each nostril once a day. Once the symptoms improve, you may choose to switch with your doctor's approval to a maintenance dose of one inhalation a day. Children aged 6 to 12 years: one inhalation in each nostril once a day. The duration of treatment should be determined by a doctor. Nasonex is not suitable for children under six years of age. Read the package leaflet before use. Growth suppression in children (only if used long term). Consult a doctor if these or other side effects are severe. For more information on Nasonex, see the package leaflet. You have an infection in the nasal passages or have recently had nasal surgery, in which case you should wait until the nose has healed before using Nasonex. Before you take Nasonex, tell your doctor if you have or have been near someone with chicken pox or measles. For more information on contraindications, see the package leaflet. Do not use Nasonex if you are pregnant or breastfeeding, unless otherwise advised by your doctor. Nasonex does not interact with alcohol or impair your ability to drive safely.